Always More to Hear: Need something to do tonight in the Bay Area? How about some Japanese Rock or 3-part Klezmer vocals? Need something to do tonight in the Bay Area? How about some Japanese Rock or 3-part Klezmer vocals? "We have ourselves, the music and our inspirations. Is there really anything else?" This is how Peter Phillips, director of the Tallis Scholars describes his relationship with music that was written 500 years ago. Phillips describes the Renaissance, the rich and glorified era of Michaelangelo, DaVinci and Machiavelli, as "the only period which can be said to have been dedicated to choral music." Through the Tallis Scholars, Phillips has successfully interpreted this music for the 21st century. This pioneering choral ensemble has created a standard of excellence and beauty for Renaissance sacred music that has basically been untouched since its inception. They have been recognized around the world for their depth and variety of repertoire and their purity and clarity of sound. This music is THE most gorgeous music I've ever heard and will probably provide the most spiritual/religious emotions and experiences for me personally. If you want the full effect, turn this up, LOUD. That's the way classical music was meant to be heard. After that I'm heading over to the Independent to check out this years crop of Japanese SxSW bands. Every year, Japan sends about a dozen bands/musicians to the SxSW festival for two nights of showcases. Then, they go on tour. Japanese bands put on an awesome show, like much of Japanese culture, nothing only goes half way. Check out the line-up and tour schedule, they might be coming your way. Also happening tonight is the Jewish Music Festival's West Coast premiere of the Sister's of Sheynville and Gaucho. 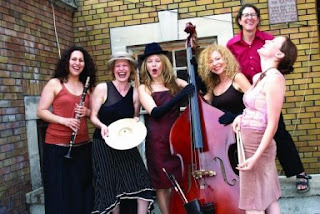 Inspired by the legendary Barry Sisters of the 1930s and 1940s, this all-female Swing-Klez sextet was voted Canada’s top folk vocal group in 2008. Their airtight three and four part vocal harmonies in Yiddish positively sizzle with seduction. You’ll think you’re in Paris when Gaucho opens with the Gypsy Swing sounds that recall legendary guitarist Django Reinhardt. Check out some clips here and at their website.